In the midst of having fun filled family days out and adventures galore with the kids during the summer holidays I have been getting everything needed ready for back to school. Fortunately for my bank balance as we already had a well stocked uniform that still fits Bug well and is still looking as good as new I haven't had to spend a fortune on clothes for his school uniform. Being so boisterous and busy, running jumping and playing ball during playtimes one item of his school uniform has not fared as well….his school shoes. Far from looking like new as his clothes are his school shoes from the last term at school were looking scruffy, old, well worn and very scuffed at the toes. With his school shoes looking like they've been worn and abused during a magnificent superhero vs villain battle….role playing, imaginative games are all the rage with his friends so that's not too far from the truth….he was in dire need of a shiny new pair of school shoes so he can look smart once again even if it's only for a short while thanks to his energetic play. To give Bug plenty of choice and ensure he got the correct fit during the summer holidays we visited Brantano. as they stock a variety of brands including Clarks, Start-Rite and Sketchers and have an extensive range of school shoes shopping at Brantano meant Bug has a good choice of shoes to choose from to get boys school shoes that may his needs, fit and taste. Another reason we chose to visit Brantano is that thanks to their fitting service and trained fitters we could feel confident of getting the right fit for him so that he wears comfortable, good fitting and supported shoes. After looking at and strutting his stuff in a large number of school shoes Bug eventually decided on the Clarks Brontstep from the popular Stomposaurus range. As a fan of dinosaurs he loves the dino detailing! 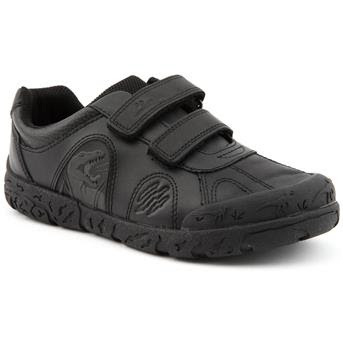 I'm hoping the durable rubber outsole with protective toe bumper and Agion linings that help keep feet fresh through out the day will help the shoes looking good for at least the first term back to school. Where do you buy school shoes?